Welcome to Meetings in Michigan’s Little Bavaria! Make your next event a unique experience by bringing it to Frankenmuth. For meetings big and small, our professional staff will assist you in finding the perfect site for your occasion in Michigan’s Little Bavaria. Come see for yourself why meeting planners say meetings held in Frankenmuth have higher attendance than meetings held in other cities. Our versatile facilities can accommodate a variety of different events. We have properties for conferences with exhibit space, meetings with breakout sessions, board meetings, retreats, trainings, reunions or a social gathering. Whether your event is simple or complex, whether it has 5 or 1,000 guests, Frankenmuth is sure to add charm and hospitality to your agenda. Site Selection Assistance – Submit a request for proposal via e-mail or call toll-free 1-800-FUN-TOWN. Your information will be forwarded to our properties and they will each respond to you directly with a proposal, based on availability. Service Provider Referrals – The downloadable Meeting and Convention Planning Guide is available with all the resources one would need to plan an event in Frankenmuth. It includes information regarding hotel accommodations, convention space, entertainment referrals, airports, rental companies, medical facilities and other important contacts that may be needed when planning a meeting in Frankenmuth. City-Wide Site Inspections – A guided tour of the Frankenmuth area meeting facilities, hotels, restaurants and/or a city-tour are available, upon request. Partner Program Suggested Itineraries – We can assist you with suggested itineraries for spouses or guests of your meeting attendees. 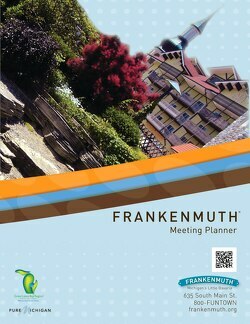 Destination Promotion Assistance – Frankenmuth welcome packets (visitor guides and coupon books) and photos are available to assist you in promoting your event that will be held in Frankenmuth. Welcome Packets & Coupon Book – Packets include a Frankenmuth Visitor Guide with a walking map, brochures on various popular attractions and a coupon book which has more than 70 coupons for guests. The complimentary packets can be ordered by e-mail, phone, or in person at the Frankenmuth Visitor Center. Welcome Address – Based on availability, a Frankenmuth representative will welcome your group to our community. Contact us at 1-800-FUN-TOWN (386-8696) or groupsales@frankenmuth.org to request a Meeting and Convention Planner and begin planning your next event in Michigan’s Little Bavaria. Frankenmuth holds the ticket to sports fun! Event organizers will find Frankenmuth’s convenient size, location, and variety of athletic venues to be a hit with participants and spectators alike. After the event, Frankenmuth has one-of-a-kind attractions, dining and fun for athletes and their families to enjoy. Venue Selection Assistance – Submit a request for proposal in one of many convenient ways; complete the online form, email your request or call toll-free 1-800-FUN-TOWN. City-Wide Site Inspections – A guided tour of the Frankenmuth area facilities, hotels, restaurants and/or a city-tour are available. Partner Program Suggested Itineraries– We can assist you with suggested itineraries for families or guests of your athletes. Destination Promotion Assistance – Frankenmuth brochures, photos and videos are available to assist you in promoting your competition event held in Frankenmuth. Welcome Packets & Bavarian Bargain Coupon Book – Packets include a Frankenmuth Visitor Guide with a walking map, brochures on various popular attractions and a Bavarian Bargains coupon book listing special offers for guests.